We receive UFO sightings at the rate of one a week. The vast majority of reports are lights at night time with the occasional picture or video. One day (fingers X) we'll get a UFO sighting in the daytime complete with video evidence. May the force be with you! The UFO sighting reports below (2013-2014) are in date order (latest at top)... its worth pointing out, we get many more than we publish, given some reports are vague or without detail. Seen a UFO? Report it here (free). My son and I observed a bright red light passing to the North of our Sorrento a house at approx 10.00 pm on Saturday 27th December this year (2014). I initially though it was the local police helicopter but the light appeared to be emitted in all directions and was a solid and very slightly pulsating red colour. We then saw another one fairly close by and travelling in the same direction at the same speed. They appeared to turn away from the Peninsula towards Queenscliff and faded almost instantly. They were followed by two more a few minutes later. These were slightly closer to us but followed the same path as the first two. Hard to tell how high they were from the ground but calculate not more than a kilometre high. They kept a steady, faintly pulsating aspect and made no noise whatsoever. The following night we went out on the deck at the same time and saw another two almost immediately. Saw some amazing lights over Fairfield tonight 10.50pm. They looked like lanterns floating past, but didn't dwindle, seemed more purposeful than lanterns. They just glided by so peacefully and disappeared into the clouds. Watching the meteor shower from my backyard in Boronia & I see a bright light "hovering" in the sky.. Watch closely & the light DODGES a meteor!!! Thinking my eyes are playing tricks on me, it's 11pm & I'm tired, I wake my husband.. We watch the light flicker red, white.. Then it dashes across the sky to reappear back where it started. The sky is clear & weather is good. Looking north west from 11pm to 11:45pm with the light remaining in the sky, hovering, darting, DODGING the entire time. This is not debris entering our atmosphere.. This is something with a mind of it's own! Video on YouTube was recorded on the 27/10/2014 approximately around 2a.m-3a.m. I'm wondering if anyone else saw this in Craigieburn Melbourne Victoria? Click on the image below to view a larger image where you can see the UFO on the top of the trees (centre) in the distance next to a cloud. At approximately 10.45pm on Wednesday, November 12, my 18-yr-old son and I observed three silent unidentified aircraft and accompanying lights flying in formation across the night sky above our home in Mooroolbark. We have never seen anything like it before. There was an eeriness which accompanied the sighting. The lights moved rapidly across the sky and then stopped and hovered in the sky above our home in a west to north west direction. The lights appeared very high in the sky. The three craft came together and then were still for several minutes before dispersing in three directions: west north westerly, westerly and north. The dispersion was fast. Too fast for a plane or helicopter. They just seemed to vanish. We took photos which show tiny red images in the sky. We hope this is of assistance and the sighting has certainly changed our opinion of the existence of unidentified flying objects. G'day, friends of mine saw the same orange/red lights in the sky last nite over Mooroolbark. They phoned me at 11:00pm Wednesday 12th November all exited saying that they've got video footage of a ufo. I raced over there and had a look and it showed three orange/red lights in a triangle then another appears to make 4 then the video stops but so they tell me after this they just vanished 1 by 1. My partner and I were standing in the driveway of our property in Kilsyth, when I noticed an object in the sky out of the corner of my eye. Initially I believed the object to be a commercial airliner. I then realised it wasn't a jet, as there was no accompanying airliner noise, in fact the object was silent. The object resembled a fireball, and it was travelling North-South. 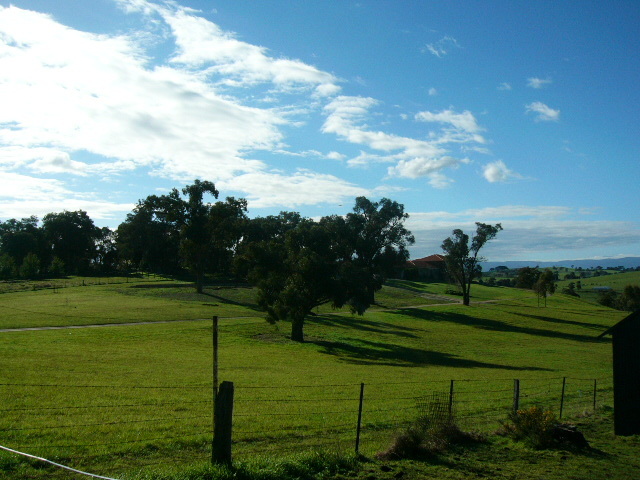 We were facing toward Mt Dandenong (East). We watched the object on its trajectory and it appeared to be moving faster than any jet I have seen. At one point a ball of flame fell from the object. We watched the object continue its path across the night sky until it was out of view. This took place on Saturday 18th October 2014 at approximately 8.15pm. It was just after midnight my partner and I were both outside, I then went inside to go to bed when he yelled out to me to come quickly, I raced outside and could see this unusual bright red circular light it was pulsating and I was watching it hover in the one position (north west from my house in Bundoora) my partner said that when he first spotted it, it was moving around in a zigzag direction. After watching it as a bright red light it changed colours from red to blue and white, then it would disappear and come back again a few seconds later. I raced inside to get my phone, I was aiming my phone at the light object but hadn't pressed the record button (I was in a panic and not thinking straight)and once I realised this it was now too far away and the phone's camera couldn't pick it up. We witnessed this UFO travel from the west to far away in the horizon of south east so quickly it was unbelievable, we would see the lights appear and disappear and when it had reappeared again and had traveled so far (last seen in south east). I was able to pick up a few blinks of the UFO's white light on my phone's camera, it didn't pick up the red or blue. We live in a flight path zone for airplanes flight path direction plane's travel in, they come in - from the east straight to the west and they do not hover, a planes blinking lights are very distinctive and familiar to me because I see them all the time where we live so I know the difference. This was 100% a UFO. Did anybody else see a large, bright regularly shaped metallic object moving very high up over Melbourne today? It is Friday September 12, 2014, and I saw what may have been a very large low satellite or ufo moving across the sky at about 2.45pm (broad daylight). The object was visible in the sky for at least fifteen minutes before it went behind a cloud. It seemed to be very high up above the clouds, but I thought I could almost see the shape of it - it was a large smooth metallic object, irregularly shaped and so giving the effect of glowing brighter and then dimmer at regular intervals as it slowly rotated. At first I thought it was stationary, and I was confused because it looked like a very bright star at two o'clock in the afternoon, but definitely brighter than a star or even a planet at night. I think it could possibly have been a large low flying satellite but I don't think so, and it was too big to be a weather balloon or anything smaller than a jumbo jet, but it was further up than a commercial airline with no flashing lights and more regular shape. It must have been big because it very high up, way up past the clouds and moving so slowly across the sky I thought it was stationary; of course it was travelling quickly because it crossed a good stretch of sky while it was visible to me for about fifteen, twenty minutes. Some of my colleagues came out from work to look at it too. One of my colleagues though it had what she called an aura around it, but I'm not sure about that. One of the others was interviewing somebody for a job. so she didn't want to be distracted by a possible UFO sighting but she came out and had a look. I was in Coburg (inner North) facing south-east; from me it started off in the south and moved north, to the east of the sky, maybe following the coastline? Very high up! No, it was definitely not an aeroplane or helicopter either. It was a very shiny metallic object. I think it could have been a satellite but I also think it could have been a ufo, so I'd be interested in hearing from anybody else who saw it or managed to record it. Around 630-730 in Elsternwick looking up at the sky (I was facing the bay) I was watching a very clear bright satelite crossing the sky towards me when I spotted something else heading in the opposite direction. It was a circle of white lights that came into view then faded out after a few seconds. the lights were very dim, almost not visible, they seemed larger than the satellite, they moved in the opposite direction as though they were flying in formation or they were one single object. I'm glad a friend of mine saw it too otherwise I might have thought I had imagined it. I'm very interested in space/astronomy/ufo's and always wanted to see something like that. I fear i could look at the sky every night for the rest of my life and not see anything like that again. as I've seen nothing even close to that before. I've seen 100's of satellites and many awesome shooting stars, I watch planes all the time, this was completely different to anything I've seen before. I have no idea what it could have been. Definitely not a plane, satellite, shooting star, space junk or optical illusion. It seems everyone saw the dazzling light display in the sky last night at anywhere between 9 and 10pm (most 9:40pm). It has yet to be confirmed exactly what it was but a meteor shower or space junk burning up appears the likely answer. Burning tail, long flaming tail, slow moving, bright white lights, orbs flying, burning sulfur, falling stars, but whatever it was, people who witnessed it said it was extraordinary. Reports have it travelling in every direction, turning corners and lasted for about 20 seconds. No sound. It was seen right across Victoria and in some parts of NSW. TheAge (below) have a small compilation of videos. At 9.45pm 1/07/2014, in Chirnside Park looking east towards Lillydale, I saw two bright red lights moving from the horizon towards me very rapidly and stopped above the quarry area. I shouted out to my family to see this as they came outside the lights stared to go up and fade out. A third light came from the same direction and did the same thing. All the bright lights hovered in the one spot for about one minute. They acted like helicopters but there was no sound and they were large. Did any one else see this? I was in my back yard in Hastings around 7pm glanced up at a very bright star towards Mornington and seen what I thought at first glance to be an airplane moving away from the bright star heading towards Tooradin but there was no noise of engines or flashing lights then just gone. For those with sightings in Berwick/Narre Warren. There was a wreckage that they found many years ago where Fountain Gate shopping centre [...] is now. I read it in the paper and they believe that wreckage was part of a ufo ship which alians/ufos are probably trying to track down and are possibly looking for it which is why we get so many sightings here. I also heard that wreckage is on display some place near there. Around 10:30pm I was in the backyard looking towards Cranbourne and what caught my eye was a large ball of light soaring through the sky faster than any plane and definitely didn't look like any shooting star Ive seen before. Then looking in that direction these orange balls of light in triangle formation flickering, when flickering seemed to be changing color took roughly 2hrs to break formation and disappear all while a single ball was shining brightest looking more toward Clyde was just crusing round slowly getting further into the distance I had to take a step back every 5 10 minutes to keep it in my vision, have seen weird thing before but not like this was definitely not usual. Wondering if anyone else had seen or noticed anything similar? Tonight at 9:00PM EST in Malvern East I witnessed a very unusual object. I went outside to have a smoke and star gaze and a bright green and red light was pulsing and changing from green to red it was the shape of an orb. The colour changes were randomly timed not a pulse light that you would see on a plane or chopper. When I first saw it it was heading north I called out to my mother and sister and they came outside and watched it with me. It seemed to reverse without noise or turning around and came back overhead I have to admit I was freaked out enough after it was hovering silent and still right above us for 30 seconds without any noise and switched my outside sensor light off. After I did so it seemed to move on...thank god! We continued to watch it for another 3 minutes as it started moving again in a south direction made a curved fast turn went north east for a few seconds then continued in a north east direction until we lost visual. It was heading towards ashwood/ mt waverley direction. I am sure it wasn't a plane or helicopter. There was no noise and they do not have the ability to go backwards like this one did. It was not a blimp. The only other possibilities were a drone of some sort or a UFO. I would think that it was too high for a drone but I am not sure of what they are capable of in terms of altitude. This has me puzzled and I hope to hear from anyone else that saw the same thing in the same location and time. Over the bay in Melbourne last night was a massive arc which stretched from Bentleigh to as far as you could see in Port Phillip bay. It looked like a sky writers trail but took over an hour to disperse. It was the only formation in the sky no clouds. I missed it starting but saw a slight flash and went out to look and saw this line in the sky. Would have thought it was a plane but they don't fly over this way at 1am. Last night at around 12:40 (well technically this morning) I was walking home after having a few drinks at a mates house. All of a sudden what appeared to be a beam of light lit up a trail in the sky. Initially I thought it was a beam of light from a helicopter but soon realized it was a chem trail that arched across the entire sky (going from east to west). I then looked further down the trail to see three faint red lights in the distance which slowly disappeared. My second thought was that it could have been a comet but after looking at youtube videos of comets I realized it was moving way to fast for it to be a comet. Strangest thing about the whole incident was that it made no sound and that it was moving fast enough for me to think it was initially a beam of light. So yeah Marc, I'm guessing we saw the same thing. What was the slight flash you saw? Re Marc: I googled 'chemtrails' and ended up greatdreams.com. I was surprised to see the photo on this page of the random criss-crossed line formations of 'clouds'. I saw these exact lines in the sky almost directly over our house, a bit toward bayside, within the hour following this chem-trail or 'arc' that we are discussing. Did u guys see that? There was a large moon that night and the sky was quite clear. These cloud lines were very visible and I remember thinking they looked strange, nothing like ordinary clouds look. I suspected the two incidents were related. I had no knowledge at all about chem-trails or deliberate government atmospheric spraying before. On the 18th of March, 2014 at 1.45 am my partner was craving a coffee and some crispy creme doughnuts before he started work. We decided to take a short drive to 7-11 only to realize there was neither coffee or doughnuts, so then opted for Maccas. Taking a short cut home meant travelling down a pretty deserted road, where I noticed a huge bright light in the sky shining towards us. I looked at my partner and asked him what he thought it was. The light was unnaturally bright. As we moved closer to the object, it turned its lights away from us and began moving closer to the ground. At this point I was terrified and intrigued. Was it an aeroplane or UFO, I hadn't decided yet. Convincing my partner to turn around and get a closer look, we noticed how close it had moved towards us without us even realising, it was a peculiar shape with multiple colored lights flashing from it. We spotted green, white, almost like an LED type of light, red and blue. We both noted that the object did not emit any type of sound what so ever. It simply hovered in the air. Petrified upon realising it was not an aeroplane, I told my partner to drive home. As we looked back at the UFO it descended towards Sunbury area at an unnatural speed. Reading Jackies post from Sunbury we believe this could be the same UFO she is spotting every morning. My partner was a skeptic and always told me he'd never believe in UFO's, after last night though he's not so skeptical. We went back tonight to see if we could spot anything out of the ordinary but ended up seeing lots of stars and one aeroplane, which I can assure moved nothing like the object we saw. We were both really shaken that night but are now just really intrigued. At around 8:50am, I was walking to my school which is located in North Melbourne near the Royal children's hospital. Anyway, I looked up at the sky and I saw a fluorescent green sphere flying in the clear blue sky for around 10 seconds. It was flying in a fast and straight direction towards Melbourne CBD. My friend suggested that it may have been a green helicopter but helicopters usually have a distinct sound as they fly in the sky. The green sphere didn't produce any noise at all and I have good hearing. I usually get excited whenever I read UFO stories but right now, I'm actually kind of traumatised. Hopefully it was just my imagination. About 8 am Tuesday 11th of march , While standing out the front of a worksite in Brighton I noticed 3 bright white objects quite high up but very visible against the grey cloud cover tracking along the sky together in a rather erratic path as I watched the objects seemed to spiral around each other for a time , all this taking place at high speed then they moved higher and disappeared through the cloud cover. On Sunday the 9th March at about 9:30am over Hastings my girlfriend and I saw a bright orange thing in the sky like a star slowly moving! As we kept watching another one appeared. Then we saw about 10 small white objects moving around close to the bright orange lights! We were trying to work out what it was, maybe people parachuting, as these objects looked extremely far away. We kept watching and and 2 more large bright orange objects appeared. Then we noticed there were about 20 to 30 smaller white objects moving around. The 4 bright orange light also looked like small balls of fire at times. After watching for about 10 minutes we realised they were not parachuters! I've seen plenty of parachuters! They kept circling around the orange lights, there were no sounds of planes! They were heading North to South East heading over Phillip Island! we witnessed this for about 20 minutes before they disappeared! Approx 10-15 am south east direction in Berwick silver/white ball it was stationary, then moved upwards and appeared to float about like a balloon then it zig zagged left and right and took off in a straight line southerly and disappeared. 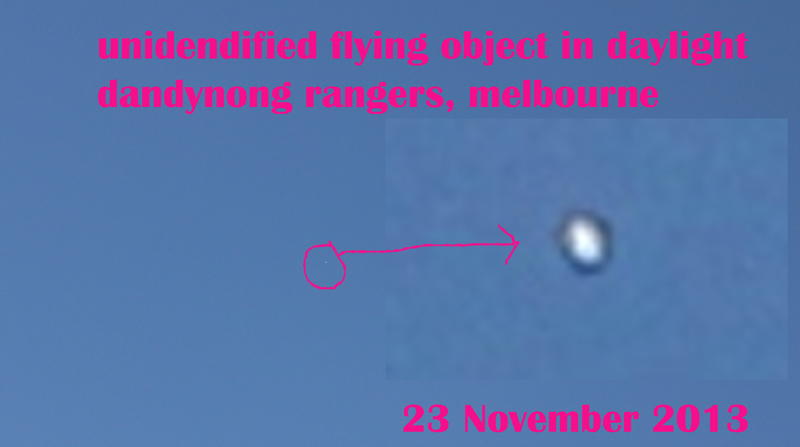 I was watching others plane in the area and this object appeared on about the same route as passenger jets approach Melbourne from the south east. This is the second time I have seen this type of object in this area, I have seen other unexplained objects as well around here over the last 45 years of living here. 9:52pm 1st March - My wife and I were sitting outside facing north when we both saw two constant , bright lights close together move rapidly north east to north. Visible for only a few seconds before appearing to fly behind a thin band of cloud. Unlike the constant air traffic we often see following the same route, they were moving much faster and did not reappear from behind the clouds. We see satellites , helicopters , airplanes all from this spot but nothing like this before. Today at 11.15am over Beveridge Victoria, I watched a metallic shinny object move quickly over the sky at a great speed.... I noticed that there wasn't any wing spans or jet streams. I watched for several minutes when it darted into a cloud and never re-emerged. The weather was bright and sunny. I'm hoping that someone else may have seen this? Ok so I don't know what I saw or what it is, I've never been one for believing in these things but last night I seen something so weird that followed me for several hundred metres. Now there could be a simple explanation but from what I seen and what happened I have none. So I finished work last night around 11pm on Malvern rd in South Yarra. For some reason I looked at the sky and noticed these faint blue lights slingshotting themselves through the sky and then coming back and crossing over each other. My first thought was spotlights or something.. So I walked a further 200 metres and noticed that the lights were still there but had followed me and sat right above my head. I had a really weird sensation run over my body became a little scared or something I don't know what the feeling was but I didn't want to be around it anymore. So I jumped on a tram from chapel st and commercial rd in south Yarra and took it to the Alfred hospital and thought they would be gone if they were spotlights or a helicopter or whatever. When I got off the tram the first thing I did was look up at the sky, yes they were there right above my head. I had no idea what was going on so I ran home like a little girl and went straight to bed. I have video from when I first seen it to when I got off the tram and it was still there. I don't know what it was but it sure gave me the chills. Yesterday afternoon as I as sitting in my office in Brunswick on the first floor when my boss noticed something out the window facing south towards Brunswick West/Essendon area. It was a few kilometres away, low in the sky below the clouds. But it was still, not moving at all. At first we all got excited and went over to the window trying to identify what it was. It was a slender silver or highly reflective object with a slight bulge in the middle. At first I thought it was a shiny smallish aeroplane (since Essendon Fields is not far away) but the fact it was not moving and did not have a fuselage I began to realise what I was seeing. I could not for the life of me tell you what this thing was, but it was a wide, slim craft of some kind. I went to grab my phone and realising I would have to zoom in quite a bit to capture it I looked up towards the UFO and it was gone. I turned to my co-worker and asked where did it go? She replied that she didn't know, it just faded away. Around 9am this morning, I was heading north down Looker Rd in Montmorency. I by chance looked off into the distant sky and caught a shiny metallic object that was catching the sun. It looked triangular in shape and was there for about 10 seconds and then it vanished. I think I saw the same object that 'Shannon' saw. I was going home. Heading north on Beattie Street. Looker road is south Easterly to Beattie Street. I looked up to my right, quite high behind tall trees was a large very shiny silver object. Large. I said to my daughter (who couldn't see it) 'That's one very shiny airplane!' I kept driving and assumed once I hit a clearing in 10 m or so I'd have a clear view. It vanished. Now, I'm an exceedly logical person but I definitely saw something non earth of origin. I feel it was an elongated object. But from Shannon's view maybe it had angles I couldn't see. I was driving to work to do an early shift. I was on Heatherton Road going towards Endeavour Hills. I saw these two orange lights in the sky in a triangular shape. I thought it was a helicopter at first, but then there is no noise, and I thought maybe a plane but,it was too low to be an Airplane. Then it vanished, I couldn't see it anymore,and I said to myself I've seen a UFO, but I didn't tell anyone at work because they may think I am crazy. I told my husband thought and later a friend and he said that they have been sightings in Narre Warren North. On the 8th of Feb 2014 at 5am I looked into the sky north east from Sunbury I saw a very bright light coming towards the airport which looked like a plane coming in to land, but it stopped in one spot for half an hour & through the binoculars it looked like an umberella with a spray of lights like coral. From 5.30 onwards it keeps climbing high into the sky still very bright. Every morning since then it comes to the same spot & keeps climbing, it is even showing through the smoke haze. Curious to know what it might be. Today at around 1330hrs, my daughter, fiance and I noticed a small bright light almost like distant star over Hampton east, it remained stationary for quiet while then very slowly it traveled in a westerly direction. We lost it in the chem trail however we spotted it again but this time more easterly right above our house not towards the bay, it remained in one spot for a few minutes then started moving slowly westerly again, there was no sound of jets nor did it flow with the wind so I dismissed a weather balloon. On the 5th Jan 2014, at 11.20 am, I was outside putting the washing on the line. I heard an aircraft passing over head, on glancing up I saw a Virgin aircraft on its north to south approach to Melbourne airport. This is a common occurrence, as the aircraft follow the Lancefield Road on their left. I then noticed a very bright object about a hand span to the left of the aircraft. This object seemed to be higher up than the aircraft, and about half the width of the aircraft fuselage. The shape was similar to the photo taken late last year. (See below, a slightly squashed sphere). The object moved slower than the aircraft, which moved out of sight, quickly. The object moved in a160 degree direction from magnetic north. My first thought was that the object was a silvered balloon, but at looking at the direction of the clouds, it was moving almost across the wind blown clouds. Wind at that time was WNW, at 37 km/hour. (Melboune weather radar). The object was very bright, as bright as Venus, with a slight darkening on the right hand side. Note the Sun was almost overhead, so the shadow should of been below the object, which was not the case. My only other thought was that the object could of been a satellite, but it seemed to be too large, and moved a little to slow. I do not know what this object was, but was very interesting. Yet another sighting in Narre Warren South...would *love* to know what is causing these lights because three sightings in less than a year (& we've been living here for 7 years) is just getting beyond a joke - something entirely explainable has to be causing them surely??! Last night (3 Jan) at just after midnight, my daughter & I had got out of the car & were standing in the driveway when we both clearly saw a large, solid, orange-gold light flying at speed away from Melbourne (ie in a west to east direction). The large solid light had a smaller light above (but attached) blinking red, white & blue alternately. It was travelling faster than a plane seems to travel. And it appeared to be slightly lower than planes travel but was still quite high in the sky. There was no noise, so it wasn't a helicoptor. After about 10 to 20 seconds of observing it...about the same time it had passed over the Berwick Springs lake & was roughly over the houses near Eden Rise, the large solid gold-orange light turned off, leaving only the small blinking light, & it continued to travel on it's course east. We continued watching it until it disappeared off in the horizon. * Have you seen it, seen something, can explain it? Send us a message using the contact us button below. On the 24/11 /2013, my partner and myself were outside at about 4 in the afternoon. We live in the Dandenong Ranges, I had my camera outside which is not unusual as I am a photographer, my camera has a zoom lens 28 -105 mm. My partner noticed a UFO - appearing as a white dot, and also noticed it was stationary .. for sometime. So he took some pics with my camera. I found it difficult to see due to my vision being short sighted, but then as we reviewed the images straight away, there it was !! I could see it on the LCD screen. I had to zoom in almost all the way, as it appears in all the photos that we took. When I processed the images, I brought it into photoshop and analysed it myself. and it looks very interesting indeed .. so not only was it seen with the naked eye as a very tiny white dot, it also appears in the all photographs. Due to the high amount of sightings even more so recently, I thought I would also share this one. Both of us are stargazers, and even looking thorough a telescope, we know due to the rotation of the earth, how quickly stars move. Click on image above to view larger pic (opens in new window). Tonight around 7:40pm we were driving along the esplanade in Altona Meadows. I could see an enormous object round with lights all around it, it was moving in the same direction as my car but picked up pace which had me more curious, it was then hovering so low that I then realized planes are not a disc, a UFO? woh!! As I pointed it out to my daughter we stopped the car, she and I stared in amazement then it stopped mid air and was not much higher than the local refinary towers with lights on them. I said to my daughter as it just stayed so still...."hang on, is that just the top of a tower?" Then it moved quickly to our right and tilted down where we then saw underneath, it was like a wheel with lights flashing all around it, it then went up and moved off fast to the left and headed inland, we tried following it in my 4 cylinder, but not successful as you can imagine. There were people out and about but did anyone look up and see this? It was only a little higher than the refinery thingys that have lights on them for planes to see. We were filled with adrenalin and goose bumps. Very cool!! I can't believe I'm contacting you again (what is up with this area & weird sightings?!) & I'm hoping someone can give a logical reason for this particular sighting tonight. I was heading to the supermarket about 6pm or slightly before...traveling towards Glasscocks Rd, Narre Warren South. I thought what I first assumed was an aircraft heading East to West above Glasscocks Rd...except I then realised the flashing lights weren't the same as on a normal aircraft. Instead of having multiple lights like a normal craft, this one had only one light & was pulsing three white flashes (these pulsed quite fast) & then one, slower red (from what looked like the same light source). It traveled in a straight line for a moment, then seemed to turn & travel towards the South briefly...then doubled back towards the North...before appearing to speed up & travel West in a straight line towards the city until I could no longer see it. The craft was reasonably low...below the cloud cover & lower than a commercial craft but maybe around the height the police helicopter flies at. No discernible noise. And only one pulsing light that was changing colour...no other visible lights. By comparison, a commercial craft that I saw later in the evening (which is slightly odd as we're not under a flight path but there could be many reasons why it was flying this way), had obvious multiple lights, flashed only one colour & the strobing was much slower than the pulses on the craft I saw earlier, as well as emitting quite a bit of noise (obviously). I would like report evidence of a large ship that may have landed out the front of my house (a crop circle if you will). 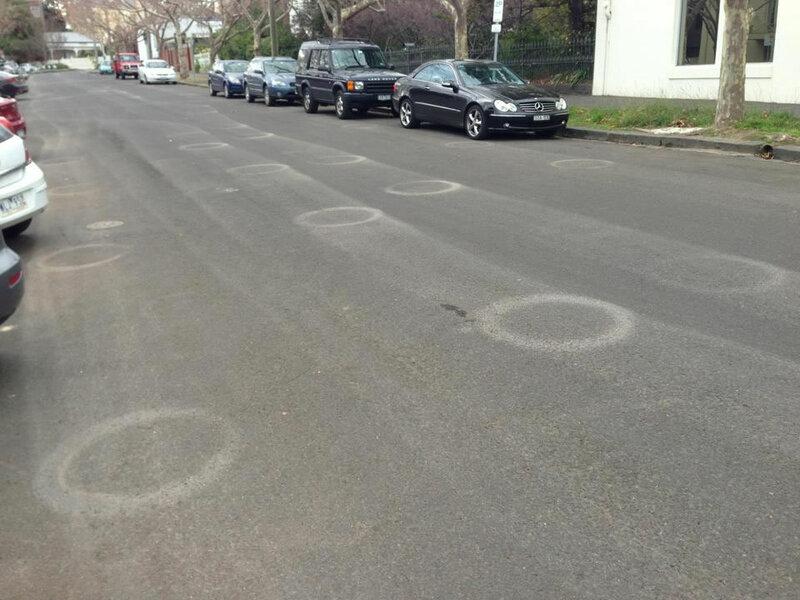 Last Friday morning I went to check the mail and noticed many circular shapes in random places all over the road out the front of my house. There must have been over 30 and ranged over a distance of maybe 25 meters. My house was in the middle of this 25 meters. These circles seemed to be joined in rows, however these rows zig-zagged from left to right. They looked perhaps like the marks landing pads would make if a ship landed slowly while loving forwards (eventually resting on these pads, making the marks). They looked like octopus rings, or sucker pads (white, and about 10cm thick with a overall diameter of maybe 50cm) On seeing these I felt a chill run though me straight away, an instant sensation of danger. I looked around for someone to comment on these marks with but found the whole road empty. This was strange as I live on a normally very busy street off Swan st, and this was around 11am on a regular business day. 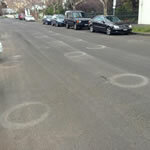 I inspected the circles for a moment but felt something odd was happening or had happened and felt I should get off the street. On getting back inside I remembered the night before my cat acting very strange. He bit me (for the first time ever), was scowling, and rolling around on the floor flipping from side to side, then docile, then would flip out again. Very strange. Anyway, I believe that whatever happened outside my house last night either effected my, or my cat's psyche or mind. I have not seen the rings again. On a side note however, I have noticed that each night there are 4 spotlights roaming the sky (I think coming from Rod Laver Arena, or possibly Docklands) If asked, I'm sure Melbourne city council would say that it is a promotion for a concert or something like that, but I think they might be deterrents for any more UFO ships that might be in our area. 4.00pm - broad day light flying very low best I can describe it was, it had a shape similar to a ninja star the tips of the wings were folded up it was white with a red bubble taking up most of the body it came over quick and made no sound it was very low someone else had to of seen this, it headed east. I was kicking myself for I had left my phone in the truck and missed a once in a life time photo opportunity. Use the REPORT button to send a UFO Sighting report.